Who's ever going to tag this QR code anyway? On AXA Bank's outdoor ad. During one of my many escapades on the road, I came across the advert above. The ad is to promote a beneficial “renovation loan” and the offer is only valid until the end of 2011. So you’d better renovate your home this year to get the deal, right? Don’t bother answering the above question. I have different issues with the ad. I believe the ad demonstrates that many marketers still don’t understand technology from a consumer mindset. I also believe that the usage of the QR code in the ad was solely driven on the fact that earlier that year a competitor launched a campaign in which the QR code was given a rather central position. So the ad clearly demonstrates “old-school competitor based marketing”. But let’s start by briefly describing the ad. 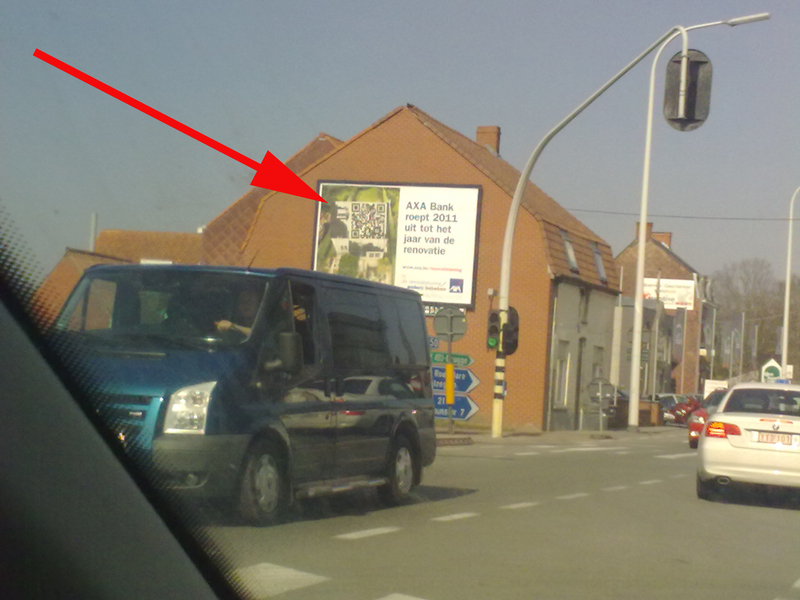 The large format printed advert is clearly divided into two separate yet linked parts. Right frame: the right frame contains the advertising copy and the logo of the company. The copy states “Axa proclaims 2011 as year of renovation”. People should link renovation with renovating a house and a special renovation loaning. So far so good, I managed to get that. Left frame: the left frame is an image. It seems as it depicts the act of tearing down your house’s wallpaper and running into a hidden QR code behind it. I didn’t see wallpaper in the left frame while driving by. But I did notice a big QR code – hence the picture. Who’s ever going to tag this QR code anyway? First of all: do most consumers already know about QR codes? Shall they realize it? Or do you only want to address the “geeks” to renovate their house in 2011? I can tell you one thing: geeks are often not that into “DIY stuff”. Maybe you’re addressing the wrong target group with your renovation loan promotions? Second, assume consumers are completely into QR codes already, how on earth can you tag this code while driving by at 90 km / hour? It’s already hard to take a picture of it. Let alone tag it with your mobile phone. To end I would dare to say that the QR code is there just because they can put it there. Or is it all about parroting the competitor? Why a QR code? Because BNP Paribas Fortis had one? I believe AXA bank used QR because their competitor BNP Paribas Fortis did earlier that year. 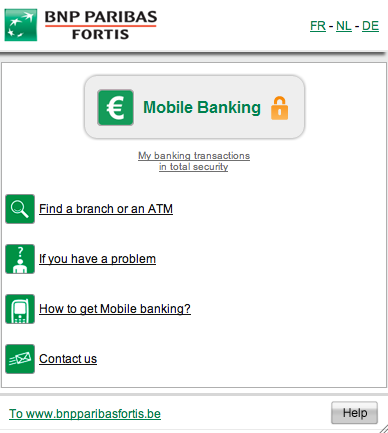 However, how BNP Paribas Fortis deployed it was completely different. 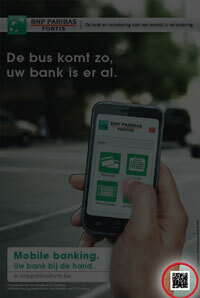 BNP used it to launch their mobile banking application and services. And because I believed it was quite impressive, I even reported on their break-through mobile banking app on this blog but I didn’t relate to the way it was promoted. Today I will though. Why would it make sense to put a QR code on an advertisement for mobile banking and not on an advertisement for renovation loans? Because a QR code is scanned with a mobile phone. People scan the code and they are automatically taken to the mobile banking app. That’s just great, that’s convenience. If you force people to scan a code that has in fact nothing to do with mobile, why would you do the effort? Why would you spend the money? Next to that, BNP’s QR codes were easily scannable. You could easily scan them because they were in newspapers, magazines and on in-bank posters. Not on large format. Not next to a speedway. Yes, early adaptors of mobile banking will probably know a thing or two about QR codes. And no, people who renovate their houses are not particularly interested in geeky stuff. Don’t just use technology because you can. Make sure it matches your target group. Don’t just do something because your competitor did. The trick is to stand out. Will never happen if you parrot! Say hello to the Hybrid Marketer. How much do marketers (& their agencies) need to know about technology? Advertisers and brand marketers are entering a brave new world — one where code is on par with content. “Consumers” are now “users.” So should “marketers” be “developers”? Enter the hybrid marketer. More and more agencies are finding they need to educate and cultivate a new breed of people who understand tech from a marketing and brand perspective, and who have a consumer mindset. At the same time, agencies are adopting practices–agile development, continuous deployment–learned from the tech world. But should they really try this stuff at home? Should “marketers” be worrying about, say, the video capability of the latest iPhone, or pushing the envelope with HTML5? Or should they just stick to their core competencies and work with established software companies / dev shops to realize their ideas? How else is technology affecting the agency model and the creative process?